Although international relations in the 21st century are increasingly characterized by the formation of international and regional institutions, their effectiveness alongside the sovereign actions of states has been questioned. The beginning of the 21st century has thus far been marked by the rise of a global economy and Third World consumerism, mistrust in government, deepening global concern over terrorism, and an increase in the power of private enterprise. The United States emerged as the sole superpower after the Cold War, but China simultaneously began its rise and the BRICS countries aimed to create more balance in the global political and economic spectrum. After the Cold War, the UN saw a radical expansion in its peacekeeping duties, taking on more missions in ten years than it had in the previous four decades. Though the UN Charter had been written primarily to prevent aggression by one nation against another, in the early 1990s the UN faced a number of simultaneous, serious crises within nations such as Somalia, Haiti, Mozambique, and the former Yugoslavia that tested its founding principles and institutional effectiveness. The World Trade Organization (WTO) is an intergovernmental organization that regulates international trade. Due to an impasse in negotiations within the WTO between developed and developing countries, there have been an increasing number of bilateral free trade agreements between governments. The renewed academic interest in regionalism, the emergence of new regional formations, and international trade agreements like NAFTA and the development of a European Single Market demonstrate the upgraded importance of regional political cooperation and economic competitiveness. BRICS: The acronym used to refer to an association of five major emerging national economies: Brazil, Russia, India, China, and South Africa. Short Twentieth Century: Originally proposed by Ivan Berend of the Hungarian Academy of Sciences but defined by Eric Hobsbawm, a British Marxist historian and author, this term refers to the period between 1914 and 1991, the beginning of World War I and the fall of the Soviet Union. confidence- and security-building measures: Actions taken to reduce fear of attack by two or more parties in a situation of tension with or without physical conflict. Confidence- and security-building measures emerged from attempts by the Cold War superpowers and their military alliances (the North Atlantic Treaty Organization and the Warsaw Pact) to avoid nuclear war by accident or miscalculation. However, these measures also exist at other levels of conflict and in different regions of the world. The beginning of the 21st century has thus far been marked by the rise of a global economy and Third World consumerism, mistrust in government, deepening global concern over terrorism, and an increase in the power of private enterprise. The long-term effects of increased globalization are unknown, but there are many who are concerned about its implications. The Arab Spring of the early 2010s led to mixed outcomes in the Arab world. The Digital Revolution, which began around the 1980s, continues into the present. Millennials and Generation Z are coming of age and rising to prominence during this century as well. 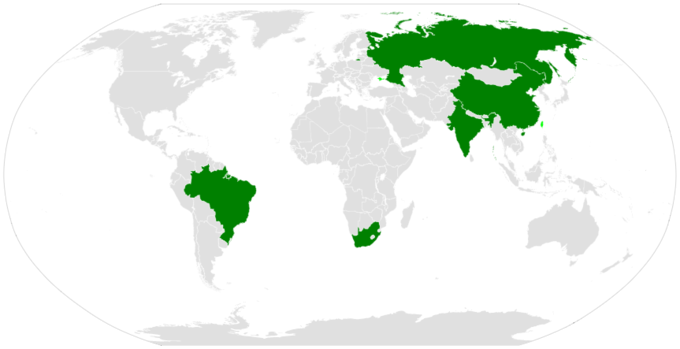 BRICS Countries: Countries highlighted in green include all BRICS countries: Brazil, Russia, India, People’s Republic of China, and South Africa. After the Cold War, the UN saw a radical expansion in its peacekeeping duties, taking on more missions in ten years than it had in the previous four decades. Between 1988 and 2000, the number of adopted Security Council resolutions more than doubled, and the peacekeeping budget increased more than tenfold. The UN negotiated an end to the Salvadoran Civil War, launched a successful peacekeeping mission in Namibia, and oversaw democratic elections in post-apartheid South Africa and post-Khmer Rouge Cambodia. In 1991, the UN authorized a U.S.-led coalition that repulsed the Iraqi invasion of Kuwait. Brian Urquhart, Under-Secretary-General from 1971 to 1985, later described the hopes raised by these successes as a “false renaissance” for the organization given the more troubled missions that followed. Though the UN Charter was written primarily to prevent aggression by one nation against another, in the early 1990s the UN faced a number of simultaneous, serious crises within nations such as Somalia, Haiti, Mozambique, and the former Yugoslavia. The UN mission in Somalia was widely viewed as a failure after the U.S. withdrawal following casualties in the Battle of Mogadishu, and the UN mission to Bosnia faced “worldwide ridicule” for its indecisive and confused mission in the face of ethnic cleansing. In 1994, the UN Assistance Mission for Rwanda failed to intervene in the Rwandan Genocide amid indecision in the Security Council. Beginning in the last decades of the Cold War, American and European critics of the UN condemned the organization for perceived mismanagement and corruption. In 1984, U.S. President Ronald Reagan withdrew his nation’s funding from UNESCO (the United Nations Educational, Scientific and Cultural Organization, founded 1946) over allegations of mismanagement, followed by Britain and Singapore. Boutros Boutros-Ghali, UN Secretary-General from 1992 to 1996, initiated a reform of the Secretariat, reducing the size of the organization. His successor, Kofi Annan (1997–2006), initiated further management reforms in the face of threats from the United States to withhold its UN dues. In the late 1990s and 2000s, international interventions authorized by the UN took a wider variety of forms. The UN mission in the Sierra Leone Civil War of 1991–2002 was supplemented by British Royal Marines, and the invasion of Afghanistan in 2001 was overseen by NATO. In 2003, the United States invaded Iraq despite failing to pass a UN Security Council resolution for authorization, prompting a new round of questioning of the organization’s effectiveness. Under the eighth Secretary-General, Ban Ki-moon, the UN has intervened with peacekeepers in crises including the War in Darfur in Sudan and the Kivu conflict in the Democratic Republic of Congo. During this time, the UN has also sent observers and chemical weapons inspectors to Syria during its civil war. In 2013, an internal review of UN actions in the final battles of the Sri Lankan Civil War in 2009 concluded that the organization had suffered “systemic failure.” Additionally, 101 UN personnel died in the 2010 Haiti earthquake, the worst loss of life in the organization’s history. The Millennium Summit was held in 2000 to discuss the UN’s role in the 21st century. The three-day meeting was the largest gathering of world leaders in history and culminated in the adoption by all member states of the Millennium Development Goals (MDGs), a commitment to achieve international development in areas such as poverty reduction, gender equality, and public health. Progress towards these goals, which were to be met by 2015, was ultimately uneven. The 2005 World Summit reaffirmed the UN’s focus on promoting development, peacekeeping, human rights, and global security. The Sustainable Development Goals were launched in 2015 to succeed the Millennium Development Goals. In addition to addressing global challenges, the UN has sought to improve its accountability and democratic legitimacy by engaging more with civil society and fostering a global constituency. To enhance transparency, the UN held its first public debate between candidates for Secretary-General in 2016. On January 1, 2017, Portuguese diplomat António Guterres, who previously served as UN High Commissioner for Refugees, became the ninth secretary-general. Guterres has highlighted several key goals for his administration, including an emphasis on diplomacy for preventing conflicts, more effective peacekeeping efforts, and streamlining the organization to be more responsive and versatile to global needs. 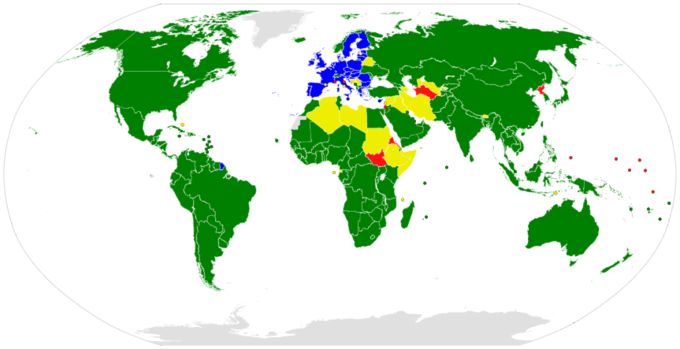 WTO members and observers: Green countries are members, blue countries are members that are dually represented by the European Union, yellow countries are observers, and red countries are non-members. The World Trade Organization (WTO) is an intergovernmental organization that regulates international trade. The WTO officially commenced on January 1, 1995, under the Marrakesh Agreement signed by 123 nations on April 15, 1994, replacing the General Agreement on Tariffs and Trade (GATT), which commenced in 1948. The WTO deals with regulation of trade between participating countries by providing a framework for negotiating trade agreements and a dispute resolution process aimed at enforcing participants’ adherence to WTO agreements, which are signed by representatives of member governments and ratified by their legislatures. Most of the issues that the WTO focuses on derive from previous trade negotiations, especially from the Uruguay Round (1986–1994). The WTO is attempting to complete negotiations on the Doha Development Round, which was launched in 2001 to lower trade barriers around the world with an explicit focus on facilitating the spread of global trade benefits to developing countries. The conflict between free trade on industrial goods and services but retention of protectionism on farm subsidies for developed countries’ domestic agricultural sector and the substantiation of fair trade on agricultural products (requested by developing countries) remain the major obstacles. This impasse has made it impossible to launch new WTO negotiations beyond the Doha Development Round. As a result, there have been an increasing number of bilateral free trade agreements between governments. Adoption of the Bali Ministerial Declaration, which for the first time successfully addressed bureaucratic barriers to commerce, passed on December 7, 2013, advancing a small part of the Doha Round agenda. However, as of January 2014, the future of the Doha Round remains uncertain. Regional integration is a process by which neighboring states enter into agreements to upgrade cooperation through common institutions and rules. The objectives of the agreement could range from economic to political to environmental, although it has typically taken the form of a political economy initiative where commercial interests are the focus for achieving broader sociopolitical and security objectives as defined by national governments. Regional integration has been organized either via supranational institutional structures, intergovernmental decision-making, or a combination of both. Past efforts at regional integration have often focused on removing barriers to free trade within regions, increasing the free movement of people, labor, goods, and capital across national borders, reducing the possibility of regional armed conflict (for example, through confidence- and security-building measures), and adopting cohesive regional stances on policy issues, such as the environment, climate change, and migration. Since the 1980s, globalization has changed the international economic environment for regionalism. The renewed academic interest in regionalism, the emergence of new regional formations, and international trade agreements like the North American Free Trade Agreement (NAFTA) and the development of a European Single Market demonstrate the upgraded importance of regional political cooperation and economic competitiveness. The African Union was launched on July 9, 2002, and a proposal for a North American region was made in 2005 by the Council on Foreign Relations’ Independent Task Force on the Future of North America. In Latin America, however, the proposal to extend NAFTA into a Free Trade Area of the Americas that would stretch from Alaska to Argentina was ultimately rejected by nations such as Venezuela, Ecuador, and Bolivia. It has been superseded by the Union of South American Nations (UNASUR), which was constituted in 2008. Regionalism contrasts with regionalization, which is, according to the New Regionalism Approach, the expression of increased commercial and human transactions in a defined geographical region. Regionalism refers to an intentional political process, typically led by governments with similar goals and values in pursuit of the overall development within a region. Regionalization, however, is simply the natural tendency to form regions, or the process of forming regions, due to similarities between states in a given geographical space. The international community’s efforts to combat climate change have often been frustrated by the economic concerns of member states. Most countries participate in the United Nations Framework Convention on Climate Change (UNFCCC), which commits state parties to reduce greenhouse gas (GHG) emissions based on the premise that global warming exists and human-made CO2 emissions have caused it. The current state of global warming politics is frustration over a perceived lack of progress within the UNFCCC, which has existed for 18 years but has been unable to curb global GHG emissions. The Kyoto Protocol is an international treaty that extends the 1992 UNFCCC based on the principle of common but differentiated responsibilities, placing the obligation to reduce current emissions on developed countries on the basis that they are historically responsible for the current levels of GHGs in the atmosphere. Of the 192 parties to the Kyoto Protocol, only 37 countries have binding targets within the framework of the Protocol, and only seven of the 37 countries have ratified their obligations within this framework. The Paris Agreement is an agreement within the UNFCCC dealing with GHG emissions mitigation, adaptation, and finance to be implemented starting in the year 2020. It is the world’s first comprehensive climate agreement and has been described as an incentive for and driver of fossil fuel divestment. greenhouse gas: A gas in the atmosphere that absorbs and emits radiation within the thermal infrared range. This process is the fundamental cause of the greenhouse effect, which warms the planet’s surface to a temperature above what it would be without its atmosphere. fossil fuel divestment: The removal of investment assets, including fossil fuels in an attempt to reduce climate change by tackling its ultimate causes. Global warming and climate change are terms for the observed century-scale rise in the average temperature of the Earth’s climate system and its related effects. Multiple lines of evidence show that the climate system is warming. Many of the observed changes since the 1950s are unprecedented over tens to thousands of years. 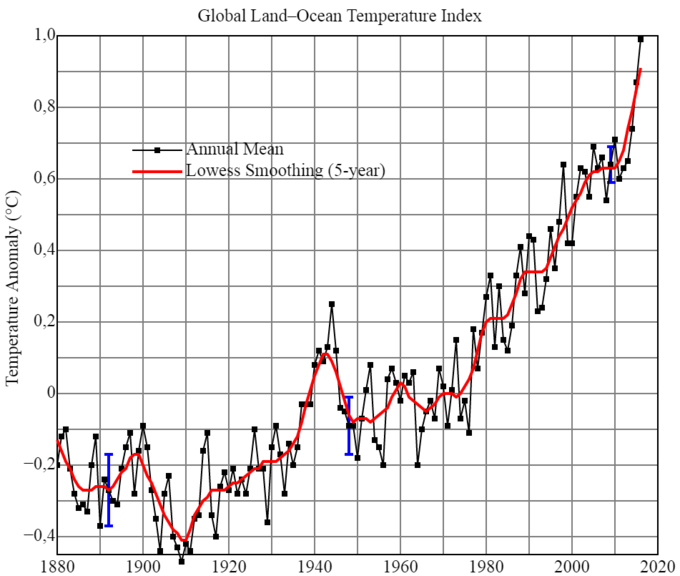 Global Land-Ocean Temperature Anomaly: Land-ocean temperature index, 1880 to present, with base period 1951-1980. The solid black line is the global annual mean and the solid red line is the five-year lowess smooth, i.e. a non-parametric regression analysis that relies on a k-nearest-neighbor model. The function is evaluated using a fraction of data corresponding to a ten-year window of data, giving an effective smoothing of approximately five years. The blue uncertainty bars (95% confidence limit) account only for incomplete spatial sampling. The graph shows an overall long-term warming trend. Most countries participate in the United Nations Framework Convention on Climate Change (UNFCCC), which commits state parties to reduce greenhouse gas (GHG) emissions based on the premise that (a) global warming exists and (b) human-made CO2 emissions have caused it. The ultimate objective of the Convention is to prevent dangerous human interference of the climate system. As stated in the Convention, this requires that GHG concentrations are stabilized in the atmosphere at a level where ecosystems can adapt naturally to climate change, food production is not threatened, and economic development can proceed in a sustainable fashion. The Framework Convention was agreed in 1992, but since then, global emissions have risen. The current state of global warming politics is frustration over a perceived lack of progress within the UNFCCC, which has existed for 18 years but has been unable to curb global GHG emissions. Todd Stern—the U.S. climate change envoy—has expressed the challenges with the UNFCCC process as follows, “Climate change is not a conventional environmental issue… It implicates virtually every aspect of a state’s economy, so it makes countries nervous about growth and development. This is an economic issue every bit as it is an environmental one.” He went on to explain that the UNFCCC as a multilateral body can be an inefficient system for enacting international policy. Because the framework includes over 190 countries and negotiations are governed by consensus, small groups of countries can often block progress. As a result, some have argued that perhaps the consensus-driven model could be replaced with a majority vote model. However, that would likely drive disagreement at the country level by countries who do not wish to ratify any global agreement that might be governed via majority vote. Annual GHG emissions by sector, 2010: AFOLU stands for “agriculture, forestry, and other land use.” Emissions are given as a percentage share of total emissions measured in carbon dioxide-equivalents, using global warming potentials from the Intergovernmental Panel on Climate Change’s (IPCC) 2nd Assessment Report. The Kyoto Protocol is an international treaty that extends the 1992 UNFCCC. The Kyoto Protocol was adopted in Kyoto, Japan, on December 11, 1997, and entered into force on February 16, 2005. There are currently 192 parties to the Protocol. The Protocol is based on the principle of common but differentiate responsibilities: it puts the obligation to reduce current emissions on developed countries on the basis that they are historically responsible for the current levels of GHGs in the atmosphere. This is justified on the basis that the developed world’s emissions have contributed most to the accumulation of GHGs in the atmosphere, per-capita emissions (i.e., emissions per head of population) were still relatively low in developing countries, and the emissions of developing countries would grow to meet their development needs. The Protocol’s first commitment period started in 2008 and ended in 2012. A second commitment period was agreed on in 2012, known as the Doha Amendment to the protocol, in which 37 countries have binding targets: Australia, the European Union (and its 28 member states), Belarus, Iceland, Kazakhstan, Liechtenstein, Norway, Switzerland, and Ukraine. Belarus, Kazakhstan, and Ukraine have stated that they may withdraw from the Protocol or not put into legal force the Amendment with second-round targets. Japan, New Zealand, and Russia have participated in Kyoto’s first round but have not taken on new targets in the second commitment period. Other developed countries without second-round targets are Canada (which withdrew from the Kyoto Protocol in 2012) and the United States (which has not ratified the Protocol). As of July 2016, 66 states have accepted the Doha Amendment, while entry into force requires the acceptance of 144 states. Of the 37 countries with binding commitments, seven have ratified. The Paris Agreement is an agreement within the UNFCCC dealing with GHG emissions mitigation, adaptation, and finance to be implemented starting in the year 2020. The language of the agreement was negotiated by representatives of 195 countries at the 21st Conference of the Parties of the UNFCCC in Paris and adopted by consensus on December 12, 2015. It was opened for signature on April 22, 2016, (Earth Day) at a ceremony in New York. As of December 2016, 194 UNFCCC members have signed the treaty, 136 of which have ratified it. After several European Union states ratified the agreement in October 2016, enough countries had ratified the agreement that produce enough of the world’s GHGs for it to enter into force. The agreement went into effect on November 4, 2016. 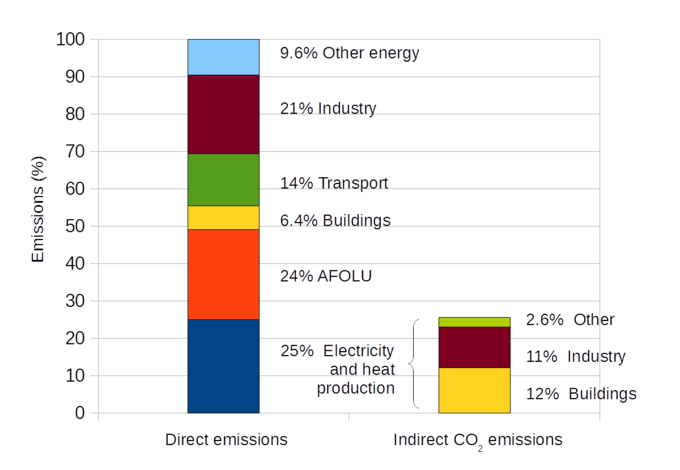 Encouraging finance flows that are consistent with low GHG emissions and climate-resilient development. The Paris Agreement is the world’s first comprehensive climate agreement and has been described as an incentive for and driver of fossil fuel divestment. Five countries are recognized as nuclear weapons states and four other countries have acquired or are presumed to have acquired nuclear weapons after the passage of the Nuclear Non-Proliferation Treaty. Nuclear proliferation is the spread of nuclear weapons, fissionable material, and weapons-applicable nuclear technology and information to nations not recognized as “Nuclear Weapon States” by the Nuclear Non-Proliferation Treaty (NPT). Four countries besides the five recognized nuclear weapons states have acquired or are presumed to have acquired nuclear weapons: India, Pakistan, North Korea, and Israel. The United States was the first and is the only country to have used a nuclear weapon in war, deploying two bombs against Japan in August 1945. Early efforts to prevent nuclear proliferation involved intense government secrecy, the wartime acquisition of known uranium stores (the Combined Development Trust), and at times even outright sabotage. Earnest international efforts to promote nuclear non-proliferation began soon after World War II when the Truman Administration proposed the Baruch Plan of 1946, which proposed the verifiable dismantlement and destruction of the U.S. nuclear arsenal, the only nuclear arsenal in the world at that time. In 1968, governments represented at the Eighteen Nation Disarmament Committee (ENDC) finished negotiations on the text of the NPT, which entered into force in March 1970. Since the mid-1970s, the primary focus of non-proliferation efforts has been to maintain and even increase international control over the fissile material and specialized technologies necessary to build such devices as these are the most difficult and expensive parts of a nuclear weapons program. Nuclear proliferation: The spread of nuclear weapons, fissionable material, and weapons-applicable nuclear technology and information. Nuclear proliferation is the spread of nuclear weapons, fissionable material, and weapons-applicable nuclear technology and information to nations not recognized as “Nuclear Weapon States” by the Treaty on the Non-Proliferation of Nuclear Weapons, also known as the Nuclear Non-Proliferation Treaty (NPT). Proliferation has been opposed by many nations with and without nuclear weapons, the governments of which fear that as more countries obtain nuclear weapons, the possibility of nuclear war (up to and including the so-called “countervalue” targeting of civilians with nuclear weapons) will also increase, leading to the destabilization of international or regional relations and potential infringements upon the national sovereignty of states. Four countries besides the five recognized nuclear weapons states have acquired, or are presumed to have acquired, nuclear weapons: India, Pakistan, North Korea, and Israel. None of these four is a party to the NPT, although North Korea acceded to the NPT in 1985 and then withdrew in 2003, then proceeded to conduct announced nuclear tests in 2006, 2009, 2013, and 2016. One critique of the NPT is that it is discriminatory in recognizing as nuclear weapon states only those countries that tested nuclear weapons before 1968 and requiring all other states joining the treaty to forswear nuclear weapons. Research into the development of nuclear weapons was undertaken during World War II by the United States (in cooperation with the United Kingdom and Canada), Germany, Japan, and the USSR. The United States was the first and is the only country to have used a nuclear weapon in war, deploying two bombs against Japan in August 1945. Following their WWII losses, Germany and Japan ceased involvement in any nuclear weapon research. In August 1949, the USSR tested a nuclear weapon. The United Kingdom tested a nuclear weapon in October 1952. France developed a nuclear weapon in 1960. The People’s Republic of China detonated a nuclear weapon in 1964. India exploded a nuclear device in 1974, and Pakistan conducted a series of nuclear weapon tests in May 1998, following tests by India earlier that month. In 2006, North Korea conducted its first nuclear test. Fat Man: A mock-up of the Fat Man nuclear device. Source: US Department of Defense. the creation of a system of automatic sanctions, which not even the UN Security Council could veto, and which would proportionately punish states attempting to acquire the capability to make nuclear weapons or fissile material. Baruch’s plea for the destruction of nuclear weapons invoked basic moral and religious intuitions. In one part of his address to the UN, Baruch said, “Behind the black portent of the new atomic age lies a hope which, seized upon with faith, can work out our salvation. If we fail, then we have damned every man to be the slave of Fear. Let us not deceive ourselves. We must elect World Peace or World Destruction…. We must answer the world’s longing for peace and security.” With this remark, Baruch helped launch the field of nuclear ethics, to which many policy experts and scholars have contributed. Although the Baruch Plan enjoyed wide international support, it failed to emerge from the UNAEC because the Soviet Union planned to veto it in the Security Council. Still, it remained official American policy until 1953, when President Eisenhower made his Atoms for Peace proposal before the UN General Assembly. Eisenhower’s proposal led eventually to the creation of the International Atomic Energy Agency (IAEA) in 1957. Under the Atoms for Peace program thousands of scientists from around the world were educated in nuclear science and then dispatched home, where many later pursued secret weapons programs in their own countries. Since its founding by the United Nations in 1957, the IAEA has promoted two sometimes contradictory missions: on the one hand, the Agency seeks to promote and spread internationally the use of civilian nuclear energy; on the other hand, it seeks to prevent, or at least detect, the diversion of civilian nuclear energy to nuclear weapons, nuclear explosive devices, or purposes unknown. The IAEA now operates a safeguards system as specified under Article III of the NPT, which aims to ensure that civil stocks of uranium and plutonium, as well as facilities and technologies associated with these nuclear materials, are used only for peaceful purposes and do not contribute in any way to proliferation or nuclear weapons programs. It is often argued that proliferation of nuclear weapons has been prevented by the extension of assurances and mutual defense treaties to these states by nuclear powers, but other factors such as national prestige or specific historical experiences also play a part in hastening or stopping nuclear proliferation. 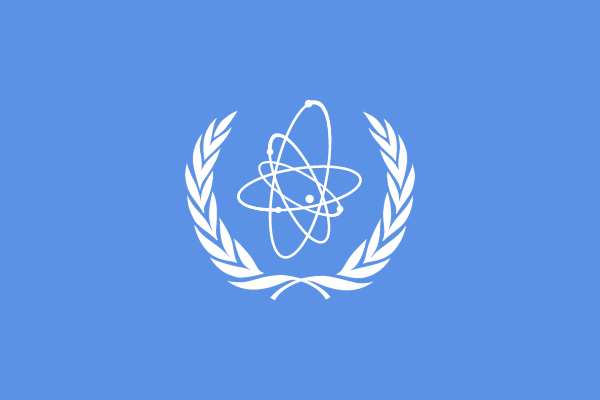 Flag of the IAEA: The International Atomic Energy Agency was created in 1957 to encourage peaceful development of nuclear technology while providing international safeguards against nuclear proliferation. Efforts to conclude an international agreement to limit the spread of nuclear weapons did not begin until the early 1960s, after four nations (the United States, the Soviet Union, the United Kingdom, and France) had acquired nuclear weapons. Although these efforts stalled in the early 1960s, they renewed once again in 1964 after China detonated a nuclear weapon. In 1968, governments represented at the Eighteen Nation Disarmament Committee finished negotiations on the text of the NPT. In June 1968, the UN General Assembly endorsed the NPT with General Assembly Resolution 2373 (XXII), and in July 1968, the NPT opened for signature in Washington, D.C., London, and Moscow. The NPT entered into force in March 1970. Since the mid-1970s, the primary focus of non-proliferation efforts has been to maintain and even increase international control over the fissile material and specialized technologies necessary to build such devices, because these are the most difficult and expensive parts of a nuclear weapons program. The main materials whose generation and distribution is controlled are highly enriched uranium and plutonium. Other than the acquisition of these special materials, the scientific and technical means for weapons construction to develop rudimentary but working nuclear explosive devices are considered within the reach of most if not all industrialized nations. Although developing countries’ economies have tended to demonstrate higher growth rates than those of developed countries, they tend to lag behind in terms of social welfare targets. A developing country is a nation or a sovereign state with a less developed industrial base and low Human Development Index (HDI) compared to other countries. Economic development originated as a global concern in the post-World War II period of reconstruction. It is related to the concept of international aid, but distinct from disaster relief and humanitarian aid. International development projects may consist of a single transformative project to address a specific problem or a series of projects targeted at several aspects of society. The launch of the Marshall Plan was an important step in setting the agenda for international development, combining humanitarian goals with the creation of a political and economic bloc in Europe allied with the U.S. In terms of international development practice on the ground, the concept of community development has been influential since the 1950s. By the late 1960s, dependency theory arose, analyzing the evolving relationship between the West and the Third World. In the 1970s and early 1980s, the modernists at the World Bank and IMF adopted neo-liberal ideas of economists such as Milton Friedman or Bela Balassa, implemented in the form of structural adjustment programs, while their opponents were promoting various bottom-up approaches. By the 1990s, some writers and academics felt an impasse had been reached within development theory, with some imagining a post-development era. While some critics have been debating the end of development, others have predicted a development revival as part of the War on Terrorism. dependency theory: The notion that resources flow from periphery or poor underdeveloped, states to a core of wealthy states, enriching the latter at the expense of the former. appropriate technology: An ideological movement and its manifestations encompassing technological choice and application that is small-scale, decentralized, labor-intensive, energy-efficient, environmentally sound, and locally autonomous. modernization theory: A theory used to explain the process of modernization within societies using a model of progressive transition from pre-modern or traditional societies to modern society. The theory assumes that with assistance, so-called traditional societies can be developed in the same manner as currently developed countries. A developing country is a nation or a sovereign state with a less developed industrial base and low Human Development Index (HDI) relative to other countries. There are no universally agreed-upon criteria for what makes a country developing versus developed and which countries fit these two categories, although there are general reference points such as a nation’s GDP per capita compared to other nations. In general, the term “developing” describes a currently observed situation and not a dynamic or expected direction of progress. Since the late 1990s, developing countries have tended to demonstrate higher growth rates than the developed ones. 2014 UN Human Development Report Quartiles: Dark blue countries are considered very highly developed. Medium blue countries are considered highly developed. Light blue countries are in the process of developing. Powder/near white countries are undeveloped. There is not enough data for countries that are colored gray. the start of the Cold War and the desire of the U.S. and its allies to prevent satellite states from drifting towards communism. The launch of the Marshall Plan was an important step in setting the agenda for international development, combining humanitarian goals with the creation of a political and economic bloc in Europe allied to the U.S. This agenda was given conceptual support during the 1950s in the form of modernization theory as espoused by Walt Rostow and other American economists. Changes in the developed world’s approach to international development were further necessitated by the gradual collapse of Western Europe’s empires over the following decades because newly independent ex-colonies no longer received support in return for their subordinate role to an imperial power. By the late 1960s, dependency theory arose, analyzing the evolving relationship between the West and the Third World. Dependency theorists argue that poor countries have sometimes experienced economic growth with little or no economic development initiatives, such as in cases where they have functioned mainly as resource-providers to wealthy industrialized countries. As such, international development at its core has been geared towards colonies that gained independence with the understanding that newly independent states should be constructed so that the inhabitants enjoy freedom from poverty, hunger, and insecurity. In the 1970s and early 1980s, the modernists at the World Bank and IMF adopted the neo-liberal ideas of economists such as Milton Friedman or Bela Balassa, implemented in the form of structural adjustment programs, while their opponents promoted various bottom-up approaches ranging from civil disobedience and critical consciousness to appropriate technology and participatory rural appraisal. By the 1990s, some writers and academics felt an impasse had been reached within development theory, with some imagining a post-development era. The Cold War had ended, capitalism had become the dominant mode of social organization, and UN statistics showed that living standards around the world had improved significantly over the previous 40 years. Nevertheless, a large portion of the world’s population was still living in poverty, their governments were crippled by debt, and concerns about the environmental impact of globalization were rising. In response to the impasse, the rhetoric of development has since focused on the issue of poverty, with the meta-narrative of modernization replaced by shorter term visions embodied by the Millennium Development Goals and the Human Development approach, which measures human development in capabilities achieved. At the same time, some development agencies are exploring opportunities for public-private partnerships and promoting the idea of corporate social responsibility with the apparent aim of integrating international development with the process of economic globalization. IMF Developing Countries Map, 2014: Dark green countries represent developing economies according to the IMF; light green countries are developing economies out of scope of the IMF; red countries have graduated to the status of a developed economy within recent history; blue countries are newly industrialized economies. Critics have suggested that such integration has always been part of the underlying agenda of development. They argue that poverty can be equated with powerlessness, and that the way to overcome poverty is through emancipatory social movements and civil society, not paternalistic aid programs or corporate charity. This approach is embraced by organizations such as the Gamelan Council, which seeks to empowe entrepreneurs through micro-finance initiatives, for example. While some critics have been debating the end of development, however, others have predicted a development revival as part of the War on Terrorism. To date, wever, there is limited evidence to support the notion that aid budgets are being used to counter Islamic fundamentalism in the same way that they were used 40 years ago to counter communism. International development is related to the concept of international aid, but distinct from disaster relief and humanitarian aid. While these two forms of international support seek to alleviate some of the problems associated with a lack of development, they are most often short-term fixes — not necessarily long-term solutions. International development, on the other hand, seeks to implement long-term solutions to problems by helping developing countries create the necessary capacity needed to provide such sustainable solutions to their problems. A truly sustainable development project is able to carry on indefinitely with no further international involvement or support, whether it be financial or otherwise. Governments undertaking broad economic objectives such as price stability, high employment, and sustainable growth. Such efforts include monetary and fiscal policies, regulation of financial institutions, trade, and tax policies. International development projects may consist of a single transformative project to address a specific problem or a series of projects targeted at several aspects of society. Promoted projects involve problem solving reflecting the unique culture, politics, geography, and economy of a region. More recently, the focus in this field has been projects that aim towards empowering women, building local economies, and caring for the environment. In the context of human development, projects usually encompass themes of foreign aid, governance, healthcare, education, poverty reduction, gender equality, disaster preparedness, infrastructure, economics, human rights, the environment, and issues associated with these. In terms of international development practice on the ground, the concept of community development has been influential since the 1950s. The United Nations defines community development as “a process where community members come together to take collective action and generate solutions to common problems”. It is a broad term given to practices aiming to build stronger and more resilient local communities. Community development is also a professional discipline and is defined by the International Association for Community Development (IACD), the global network of community development practitioners and scholars, as “a practice-based profession and an academic discipline that promotes participative democracy, sustainable development, rights, economic opportunity, equality and social justice, through the organization, education and empowerment of people within their communities, whether these be of locality, identity or interest, in urban and rural settings”. Community development practitioners, using a myriad of job titles, are employed by governmental and non-governmental organizations to build the capacity of vulnerable people to engage in development projects and programs. According to the IACD, there are national networks of community development practitioners in many countries, several hundred graduate programs training practitioners, and an extensive canon of research and scholarship, including the international Community Development Journal. The promotion of regional clusters and a thriving metropolitan economy has grown in importance among economic development professionals. In today’s global landscape, location is vitally important and becomes key to obtaining and maintaining competitive advantage. International trade and exchange rates are also key issues in economic development. Currencies are often either undervalued or overvalued, resulting in trade surpluses or deficits. With more than 20,000 professional economic developers employed worldwide in this highly specialized industry, the International Economic Development Council (IEDC) headquartered in Washington, D.C. is a non-profit organization dedicated to helping economic developers do their jobs more effectively while raising the profile of the profession. With over 4,500 members across the U.S. and internationally, IEDC membership represents the entire range of the profession ranging from regional, state, local, rural, urban, and international economic development organizations to chambers of commerce, technology development agencies, utility companies, educational institutions, consultants, and redevelopment authorities. Many individual states also have associations comprising economic development professionals who work closely with IEDC. The uneven spread of globalization’s benefits caused an anti-globalization movement to rise at the end of the 20th century. The broad consensus among economists is that free trade is a large and unambiguous net gain for society. However, some opponents of globalization see the phenomenon as a promotion of corporate interests. The global economic crisis of 2007-2008, the worst financial crisis since the Great Depression, can be credited partially to neo-liberal globalization. Globalization has fueled the rise of transnational corporations, and their power has vaulted to the point where they can now rival many nation states. Multinational corporations often benefit from globalization while poor, indigenous locals are negatively affected. Globalization sometimes requires a country to give up some sovereignty for the sake of executing Western ideals. International trade in petroleum products has expanded significantly through globalization and the spread of invasive species has also been facilitated by improvements in global transport. xenophobia: The fear of that perceived to be foreign or strange. Reactions to processes contributing to globalization have varied widely with a history as long as extraterritorial contact and trade. Proponents of economic growth, expansion, and development generally view globalizing processes as desirable or necessary to the well-being of human society. Not everybody affected by globalization believes there are benefits to its spread, however. Many individuals within the anti-globalization movement have witnessed unrest within their home communities and the world at large and questioned the basis for continuing the trend due to the sustainability of long-term and continuous economic expansion, the social structural inequality caused by these processes, and the colonial, imperialistic, or hegemonic ethnocentrism that underlie such processes. Critics argue that globalization requires nations to give up their political, economic, and cultural sovereignty and adapt to Western ways. Xenophobia can and has manifested itself in many ways as a result of globalization, involving the relations and perceptions of an in-group towards an out-group, including a fear of losing identity, suspicion of activities, aggression, and the desire to eliminate another group’s presence to secure a presumed purity. While globalization has eased the flow of international trade and contributed to greater efficiency within market economies, it has also been partially to blame for global economic crises. Additionally, globalization is not simply an economic project–it also heavily influences the world environmentally, politically, and socially. While the forces of globalization have led to the spread of Western-style democracy, this has been accompanied by an increase in inter-ethnic tension and violence as free market economic policies combine with democratic processes of universal suffrage as well as an escalation in militarization to impose democratic principles as a means to conflict resolution. Monument to Multiculturalism by Francesco Perilli in Toronto, Ontario, Canada. Four identical sculptures are located in Buffalo City, South Africa; Changchun, China; Sarajevo, Bosnia; and Sydney, Australia. A 2005 study by Peer Fiss and Paul Hirsch found a large increase in articles negative towards globalization in the years prior. In 1998, negative articles outpaced positive articles by two to one. In 2008, Greg Ip claimed this rise in opposition to globalization could be explained, at least in part, by economic self-interest. The number of newspaper articles showing negative framing rose from about 10% of the total in 1991 to 55% of the total in 1999. This increase occurred during a period when the total number of articles concerning globalization nearly doubled. A number of international polls have shown that residents of Africa and Asia tend to view globalization more favorably than residents of Europe or North America. In Africa, a Gallup poll found that 70% of the population views globalization favorably. The BBC found that 50% of people believed that economic globalization was proceeding too rapidly, while 35% believed it was proceeding too slowly. In 2004, Philip Gordon stated that “a clear majority of Europeans believe that globalization can enrich their lives, while believing the European Union can help them take advantage of globalization’s benefits while shielding them from its negative effects”. The main opposition within the EU consisted of socialists environmental groups, and nationalists. Residents of the EU did not appear to feel threatened by globalization in 2004. The EU job market was more stable and workers were less likely to accept wage/benefit cuts. Social spending was much higher than in the U.S. In a 2007 Danish poll, 76% of respondents said that globalization was a good thing. Yet a 2016 referendum vote on whether to leave or stay within the UK saw a majority of British voters opting to withdraw from the EU. Fiss and Hirsch also surveyed U.S. opinion in 1993 and found that more than 40% of respondents were unfamiliar with the concept of globalization. When the survey was repeated in 1998, 89% of the respondents had a polarized view of globalization as being either good or bad. Polarization increased dramatically after the establishment of the WTO in 1995; this event and subsequent protests led to a larger scale anti-globalization movement. Initially, college-educated workers were likely to support globalization. Less educated workers, who were more likely to compete with immigrants and workers in developing countries, tended to be opponents. The situation changed after the financial crisis of 2007. According to a 1997 poll, 58% of college graduates said globalization had been good for the U.S. By 2008 only 33% thought it was good. Respondents with high school education also became more opposed. The literature analyzing the economics of free trade is rich with information on its theoretical and empirical effects. Though it creates winners and losers, the broad consensus among economists is that free trade is a large and unambiguous net gain for society. However, some opponents of globalization see the phenomenon as a promotion of corporate interests. Many claim that the increasing autonomy and strength of corporate entities shapes the political policies of countries, crowding out the moral claims of poor and working classes as well as environmental concerns. For example, globalization allow corporations to outsource manufacturing and service jobs from high-cost locations, creating economic opportunities with the most competitive wages and worker benefits, which critics say disadvantages poorer countries. While it is true that free trade encourages globalization among countries, some countries try to protect their domestic suppliers. The main export of poorer countries is usually agricultural productions. Larger countries often subsidize their farmers (e.g., the EU’s Common Agricultural Policy), which lowers the market price for foreign crops. Thus, globalization can be described as an uneven process due to the global integration of some groups alongside the marginalization or exclusion of others. Additionally, the global economic crisis of 2007-2008, the worst financial crisis since the Great Depression, can be credited partially to neo-liberal globalization. Although globalization promised an improved standard of living, it has actually worsened the financial situation of many homes and has made the financial crisis global through the influences of international financial institutions such as the World Bank. Globalization limits development and civilization to a path that only leads to a Western and capitalistic system. Because of the political and structural differences in countries, the implementation of globalization has been detrimental for many countries. Globalization has fueled the rise of transnational corporations, and their power has vaulted to the point where they can now rival many nation states. Of the world’s 100 largest economies, 42 of them are corporations. Many of these transnational corporations now hold sway over many nation states as their fates are intertwined with the nations where they are located. Transnational corporations could offer massive influence regarding the Third World and bring about more pressure to help increase worker salaries and working conditions in sweatshops. On account of doing business globally, transnational corporations have a huge influence in many nation states. In the process of implementing globalization in developing countries, the creation of winners and losers is often predetermined. Multinational corporations typically benefit from globalization while poor, indigenous locals are negatively affected. Globalization can be seen as a new form of colonization, as economic inequality and the rise in unemployment have followed its implementation. Globalization has been criticized for benefiting those who are already large and in power at the risk and growing vulnerability of the countries’ indigenous population. Furthermore, globalization is non-democratic, as it is enforced through top-down methods. Globalization requires a country to give up some sovereignty for the sake of executing Western ideals. As a result, sovereignty is safest with those whose views and ideals are being implemented. In the name of free markets and with the promise of an improved standard of living, countries give up their political and social powers to international organizations. Thus, globalization carries the potential to raise the power of international organizations at the expense of local state institutions, which must in turn diminish in influence. International trade in petroleum products has expanded significantly through globalization. There is also a corresponding increase in activities within the petroleum industry to meet the ever-increasing demand for petroleum products. As a result, it gives rise to further environmental pollution. Petroleum is toxic to almost all forms of life and its extraction fuels climate change, including air pollution, water pollution, noise pollution, land degradation, and erosion. As international commerce develops new trade routes, markets, and products, the spread of invasive species is also facilitated. On account of the development of larger and faster forms of transport, commercial trade propels rising annual and cumulative rates of invasion.